A brief recap: document provider extensions allow you to bring up a third-party document management interface to pick and save files. These extensions are meant to offer an alternative to Apple’s new iCloud Drive UI, and, unsurprisingly, their only extension point is the default document picker of iOS 8. You won’t be able to use third-party document providers with any other menu that’s not Apple’s share sheet, which, like photo editing extensions, requires you to manually activate third-party providers before using them. Apple’s goal with document providers is to extend iOS’ file management capabilities without losing the convenience and consistency of the new extensibility features in the OS. Instead of adding a system-wide filesystem layer to iOS, Apple is reducing the filesystem, once again, to a document picker; in iOS 8, however, the picker can be extended and multiple apps can open and edit the same file without creating duplicate copies of it. Furthermore, as I noted in my review of Transmit, document provider extensions are able to relay changes to the main app that’s offering the extension without forcing you to open it: in Transmit’s case, this means that you can open files from a server configured in Transmit in any app, and, when done, changes will be automatically relayed to the source through Transmit. 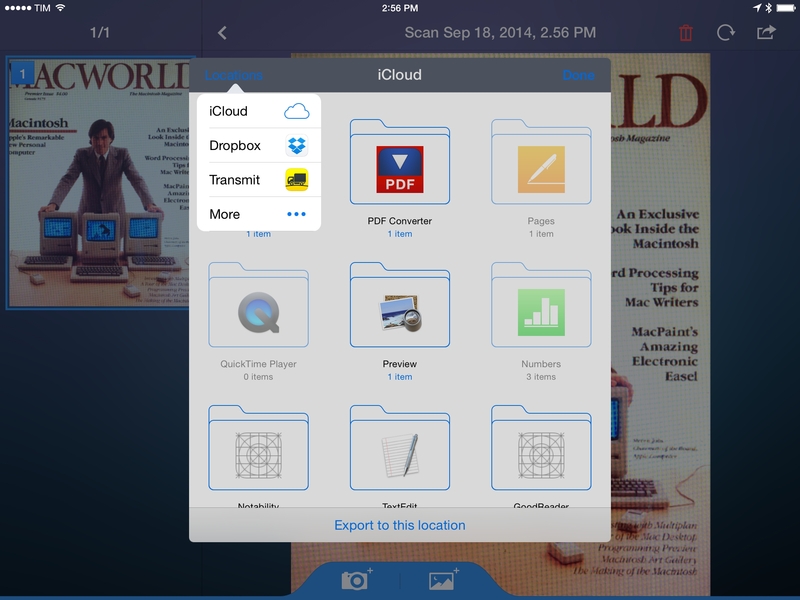 iCloud document picker (left) and Dropbox document provider extension. With yesterday’s update, Dropbox added a document picker that enables you to open and save files from and to Dropbox with any app that supports Apple’s native document picker in iOS 8. This is a massive change that, as I suspected, will let third-party services like Dropbox and Box be first-class citizens on iOS when it comes to document management. I looked on the App Store for an app that could save new files through the document picker, and I was surprised to see that Apple’s Pages doesn’t have an iCloud Drive interface yet. Fortunately, Readdle didn’t disappoint with their iOS 8 updates and added iCloud Drive to PDF Converter and Scanner Pro, which I both successfully tested with Dropbox on my iPhone 5s and iPad mini. Once enabled at first launch, iCloud Drive is available in Scanner Pro from the app’s sharing menu under iCloud Export. Tap that, and iCloud interface will come up with folders for apps that are storing documents in iCloud Drive. In the top left, you’ll notice a Locations button: tap it, and you’ll get a sheet with a list of available document pickers; initially, iCloud will be the only option listed. The setup process for document providers on iOS 8 (click for full size). Make sure that you have the latest version of Dropbox for iOS installed, and tap More; iOS will show a Manage Storage Providers view with toggles to enable third-party document providers, such as Dropbox and Transmit. Turn them on, then tap Done in top right; the document picker will be dismissed. 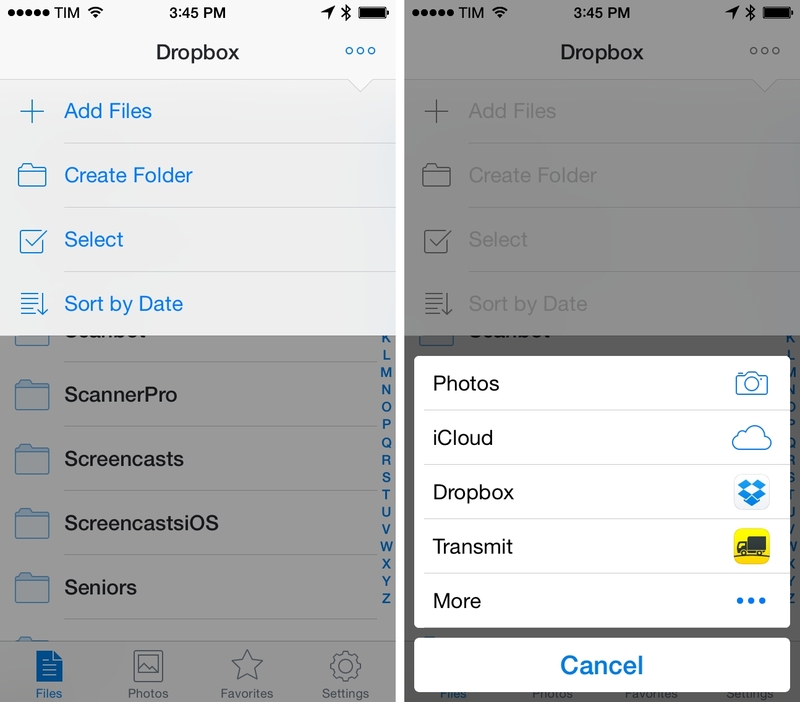 Bring it up again and tap Locations, though, and you’ll see that Dropbox and Transmit are now available options. When you tap Dropbox, iOS 8 will switch the entire document picker interface to a custom Dropbox UI provided by the Dropbox app. You will see all your files and folders and you’ll be able to navigate into folders as well. Just like iCloud Drive has an Export button at the bottom of the picker, the Dropbox document provider has a blue Save button at the bottom to save a file into the currently selected folder. Don’t tap Done in the top right: I was confused initially because I assumed Done meant “I want my file here and I’m done”. Instead, you’ll always have to use the Save button to copy a file into your Dropbox account with the document provider. In Readdle’s PDF Converter, the same concept is used to open files from a document provider. 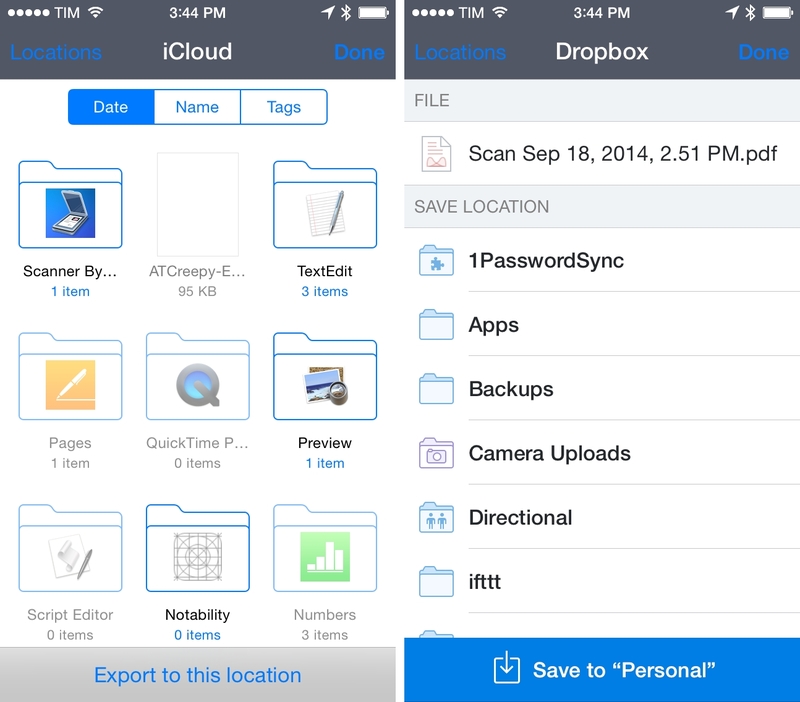 Tap Locations, choose Dropbox, and pick a file. PDF Converter will download the file and instantly convert it to a PDF, creating a copy in the app. No need to give the app your Dropbox account credentials with a login, no need to use the Open In menu from the Dropbox app to send a file to PDF Converter. Everything happens securely in the context of PDF Converter thanks to the document picker. 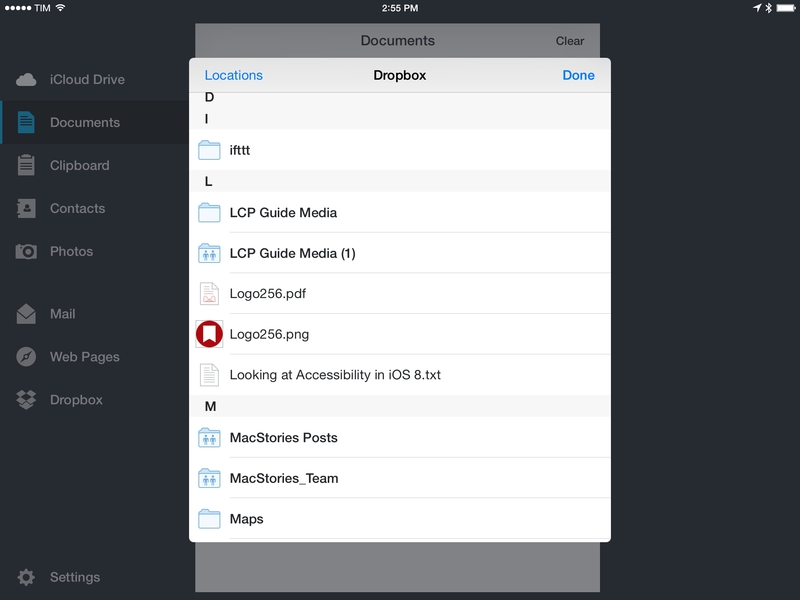 Adding files to Dropbox with the iOS 8 document picker. 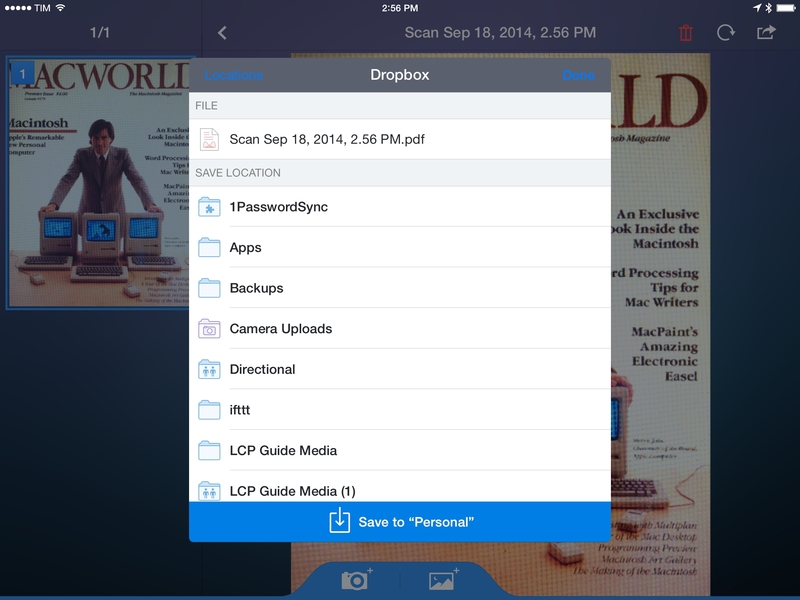 The Dropbox app itself also supports document pickers to import files from other sources without leaving the app. Tap the “More” button in the title bar, choose Add Files, and you’ll get a popover to open files from iCloud and other installed document providers. Aside from the Inception-like idea of showing the Dropbox document picker inside Dropbox, you can use this menu to import files from iCloud Drive or Transmit into Dropbox. Note that Dropbox doesn't offer the same document provider functionalities of Transmit. While Panic's app allows you, as I mentioned in my review, to open files from Transmit in other apps, Dropbox only offers an iOS 8 document picker with support for import and export operations. I’d like to point out how the Dropbox document picker displays confirmation for uploads and downloads. Instead of letting you guess whether a file has been saved or downloaded, Dropbox displays an alert with a progress bar – the same one that you get in the main Dropbox app when you interact with files. I believe that document pickers and provider extensions are going to be a big deal for people who work with documents on their iPhones and iPads every day. With providers, apps can now extend beyond their sandbox and open files from any document provider without creating unnecessary copies and wasting storage space. With document pickers, third-party services such as Dropbox and OneDrive can be available alongside Apple’s iCloud Drive and give users a way to open and save files without relying on custom integrations and interfaces – each with their own set of technical differences, limitations, and problems. While the fact that document providers are (like other extensions) limited to a single extension point will likely mean that, in the short term, old SDKs and integrations won’t be going away from your favorite apps thanks to the more granular controls they offer, document provider extensions bode well for the future of document management on iOS.